With apple harvest in full swing, are you confident that your fruit meet the allowable MRLs for your target market? Do you know the limits for the different countries you plan to ship your fruit? Where do you find out? SIR moth release device used in research trials. Many pests of agricultural or human health importance have been eradicated or controlled using the Sterile Insect Release (SIR) approach. These include the Mediterranean Fruit Fly, Melon Fly, Pink Bollworm, Oriental Fruit Fly, Tsetse Fly, Boll Weevil, Mexican Fruit Fly, Gypsy Moth, Stable Fly, Horn Fly, Corn Earworm, and Tobacco Hornworm. 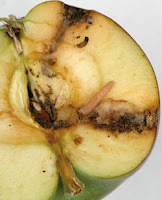 The current issue our newsletter discusses the use of SIR to combat Codling moth infestations in commercial apple orchards. To read more visit: http://pmtp.wsu.edu/newsletters.html. To view back issues of the newsletter visit our archive: http://pmtp.wsu.edu/newsletter_archive.html. 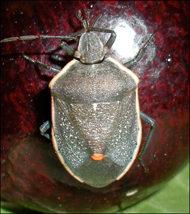 Do you have a stink bug problem or would you just like to know more about this group of insects? Our newest issue of the PMTP eNewsletter is out and full of information about stink bugs. Petal fall is traditionally a time to treat for orchard pest to get a handle on control early in the season. 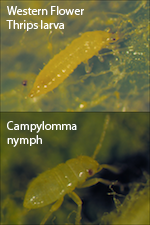 Missing treatments at this time can cause a cascade effect on insect pest populations for the rest of the growing season. 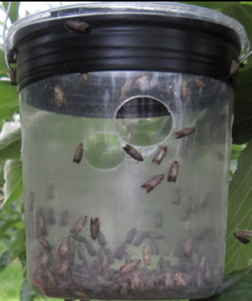 The main target pests at this time are leafrollers and codling moth. 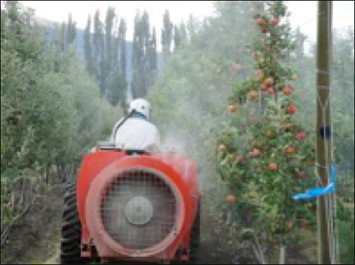 Secondary targets include San Jose scale, woolly apple aphid and Western flower thrips. But do you know what pests are actually in your orchard? Do you know how to choose the best materials for your pest problems? And just when exactly is the best time to apply your treatments? If you are sure of the answer to any of these questions you should read our next installment of the eNewsletter. In this issue we cover how to identify which leafroller you have, how to monitor for them, how to time your treatments and which materials you can you to target your specific problems. In 2007 EPA made a regulatory decision to phase out the use of azinphosmethyl (AZM, Guthion) in all agricultural crops (Figure 1). 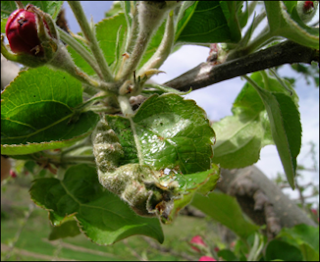 For nearly fifty years, AZM has been the primary tool used by Washington apple growers to control the key pest in apple, the codling moth. Although there were initial fears that replacement insecticides would not be registered and that there would not be effective controls available, this has not happened. 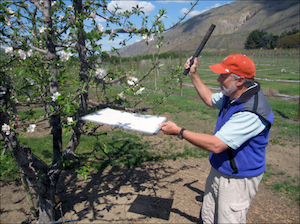 Pest management programs designed to protect fruit from codling moth have become more complicated and more expensive, but Washington growers continue to produce quality, pest free fruit. In 2011 and 2012, the maximum allowable use of AZM will be 1.5 pounds of active ingredient (AI) per acre, one application. No use of AZM will be allowed after the summer of 2012. More than fifty new insecticides and miticides have been registered for use on tree fruit crops since the passage of the Food Quality Protection Act in 1996. Many of the insecticides have been classified as reduced risk, or OP alternatives. In general, the OP alternative insecticides that have been registered for the control of codling moth have lower efficacy, a narrower spectrum of activity, and are more expensive than the OP insecticides that they are replacing. Sprayer coverage and application timing are also more critical with these new products as residues must directly contact the egg or be consumed by the feeding larvae to be effective. The Washington State University has developed the Decision Aid System (DAS - http://das.wsu.edu) and education programs such as the Apple IPM Transition Project (AIPMTP - http://pmtp.wsu.edu) to facilitate the implementation of more complicated IPM programs. USDA National Agricultural Statistics Service (NASS) survey results show that OP use in Washington apple declined by more than 50% between 2007 and 2009, from 2.4 average acre applications in 2007 to 1.1 in 2009. This change is reflected by an increase in the use of pheromone technologies (our best estimate is that 85% of the bearing apple acres in Washington were treated with codling moth pheromones in 2010) and an increase in confidence with OP alternative insecticides, which has lead to a decrease in consultant recommendations for use of OP products (93% recommended OP products in 2007 compared to 83% in 2009 - AIPMTP survey). Though these changes have been influenced by the AZM phase out, better educated growers and consultants with better resources for making decisions have made the transition away from OP insecticides successful. San Jose Scale (SJS) populations left unchecked can quickly grow into an huge problem. An infested apple can have over 1,000 or more scale. Besides making the fruit unmarketable, SJS kills twigs and limbs. If uncontrolled, SJS can kill the tree. 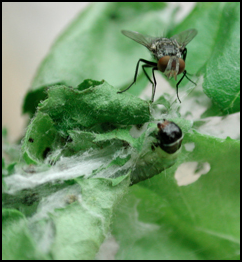 To learn more about SJS and how to control this pest read the new issue of our eNewsletter. At the start of each summer I am asked to present training workshops to a variety of Washington tree fruit industry personnel to fulfill various export work plan requirements. The first of the workshops are for stone fruit quality control cutters at packing facilities. In addition to needing preregistration in the export programs, any facility wishing to ship stone fruit (primarily apricots and peaches) to Mexico or B.C., Canada must have 2 certified cull fruit cutters trained annually. The training teaches participants how to identify the target pest, Oriental Fruit Moth (OFM) and to perform the required cull fruit screening/cutting for this pest using the required forms. This training is now scheduled for May 26 (Yakima) & May 27 (Wenatchee). For more information visit my Cullage Education web site. The second set of training workshops is for growers/field managers/field scouts, etc. that must perform monitoring and sampling for codling moth (CM) in apples destined for export to Taiwan. This workshop covers the life history and identification of CM, how to perform the required field and/or bin sampling of fruit and the correct use of the official forms. Often the workshops also include participation by WSDA inspectors to perform the required training of packing house cull fruit cutters. People wishing to perform the field/bin sampling must training at least every other year. WSDA recommends that cull cutters be retrained annually. This year's CM/Taiwan workshops are currently being scheduled. Please check the web site listed above for details on the training and updates on the schedule. Update: The Taiwan training schedule is now up. Please visit our training schedule page for more information. This is the 4th year of the EPA phase-out of AZM (Guthion). Starting this year apple growers are limited to 1.5 lbs AI per acre. This reduction limits growers to only one application of a high labeled rate for the year. And next year will be the final year (same rate) of its use. So, if you've been putting off the inevitable, it is time to adopt OP-alternative insecticides into your pest management program. Welcome to the New and Improved PMTP Blog! The PMTP Blog is now back online! We hope to use this new blog to present the material we formerly reserved for our newsletters. By posting here, we hope to keep our followers apprised of all recent news and events in a much timelier fashion. The material from our past newsletters is still available on our Newsletter Archive located on the PMTP website. Our old PMTP blog is still online and can be accessed at: pmtp.wordpress.com.